I usually use a disher when I need to fill a cupcake or muffin pan, or I pour from a large measuring cup or batter bowl when I'm making pancakes or waffles. To be perfectly honest, it's good enough. But it can also be a little messy. It's inevitable that I have drips and drops where they don't belong. So I figured I'd give the OXO Batter Dispenser ($11.99) a test drive. It's a simple concept. Squeeze, and the batter comes out. Stop squeezing and the valve keeps batter from dripping. It's not totally revolutionary - some ketchup and mustard bottles use a similar system, but with a smaller opening. For filling (and between squeezing) the dispenser fits on a base. 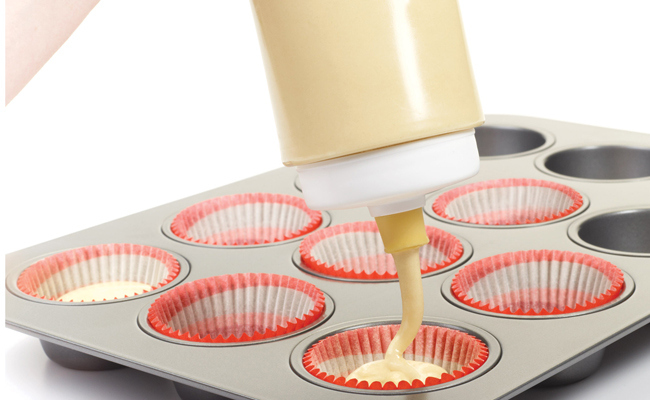 The top comes off for easy filling and it holds about three cups of batter. It comes apart for easy cleaning and it's dishwasher safe. That's all good. This held enough for a batch of pancakes I made, but a large batch of cupcakes would take a couple re-fillings. So that's something to consider. And because of the size of the dispensing opening, you're limited to non-chunky batters. Small bits are fine, but larger chunks of nuts or whole blueberries wouldn't work. It takes a couple extra seconds to take it apart before washing it, but I'm saving time by not having to clean up splattered batter that drips off a disher. It takes a little time to fill, but it's one fill for a lot of batter, as opposed to multiple dips with the disher. I'd say this has a slight edge on time spent, but not by much. Is this an essential gadget? Well, no. I've been using other methods for a darned long time and no one's complained. But I do like that this is a little neater, particularly when I'm cooking for company or when I want super-neat presentation for photos. It should also be great for funnel cakes or spaetzle, although I haven't tested it for those applications. If you follow me on Facebook, you might have seen some posts where I talked about making Christmas cookies. It's not that I'm working that far ahead for the blog - I'm baking Christmas cookies for a magazine article. While I was making miniature gingerbread houses, I had a great summer idea - using the same Good Cook cookie cutter to make little birdhouses that are perfect for summer. The gingerbread houses had an arched doorway, but I didn't like that for the birdhouses, so used an apple corer to cut a round hole. I added cinnamon flavor to the dough and I sprinkled cinnamon sugar on the roof, as well. You can certainly make these cookies without making birdhouses. This dough is great for any cookie-cutter type cookie because it doesn't spread or rise much at all, so the shape doesn't change during baking. I used a royal icing to "glue" the birdhouses together, and I brushed a thin layer of a brown royal icing onto the roof to give the cinnamon sugar something to stick to. In the bowl of a stand mixer fitted with the paddle attachment, beat the butter, sugar, and salt until it's smooth and fluffy. Add the egg, vanilla extract, and cinnamon flavoring and beat until it's light, scraping down the bowl as needed. Add the flour and mix on low until the flour is incorporated and the dough comes together as a cohesive mass. Transfer the dough to a plastic bag (or wrap in plastic wrap) and refrigerate for several hours or overnight. When you're ready to bake, preheat the oven to 350 degrees and take the dough out of the refrigerator to warm up a little before rolling. If the dough is too cold, it will crack and crumble. If it's too warm, it will start feeling a little greasy and will be soft and will tend to lose its shape when you try to move the cut cookies to a cookie sheet to bake. Roll the dough to between 1/8 to 1/4 inch thick - you might want to divide the dough in half to make the rolling easier. Thinner cookies are better for smaller cookies; larger cookies need to be a little thicker. Cut with your desired cookie cutters and place on an ungreased cookie sheet, leaving a little space between the cookies. Bake at 350 degrees until the cookies are lightly browned on the edges - 12 to 15 minutes. Let the cookies cool on a rack. Decorate as desired. Everyone needs a whisk, right? And these days, it's not a bad idea to have a coated whisk for use in nonstick cookware. There are plenty of whisks from so many different gadget manufacturers. And they're pretty much all the same, right? What makes the WhipStir 2-in-1 Whisk ($14.99) from Chef'n different from the competition is that it's a double-sided whisk. Instead of a traditional handle, the smaller end is a hard plastic whisk while the larger end is flexible coated wire. My first thought when I saw this was that it might be awkward to hold. Actually, since the smaller end is hard plastic, it's not different than holding the handle of any other whisk. Holding the larger end to use the small whisk doesn't feel odd either. It might be less comfortable than a traditional handle if you're whisking something for a long time. But seriously, when I'm using a small whisk, I'm not making whipped cream. Usually I'm mixing some cornstarch and water in a small bowl, or mixing a small amount of dry ingredients. It doesn't take long to do that. It's hard to muster up a lot of enthusiasm for a whisk, either pro or con. Whisks have been around for a long time, and unless you do a lot of hand whisking, there's probably not that much difference between them once you've decided whether you need a coated whisk or not. The bonus here is that you get two whisks in one tool - nice for starter kitchens, people with limited storage space, or who need an extra whisk and like the idea of two tools in one. ... with a touch of mad scientist thrown in, you'd have the Spiceologist Block. My friend Heather from Farmgirl Gourmet partnered with Savorx, a spice shop in her area, to create the Spiceologist Block, and now they're looking for funding on Kickstarter to pay for tooling and the first production run. Most of my spices live in a kitchen cabinet, which is where they belong. 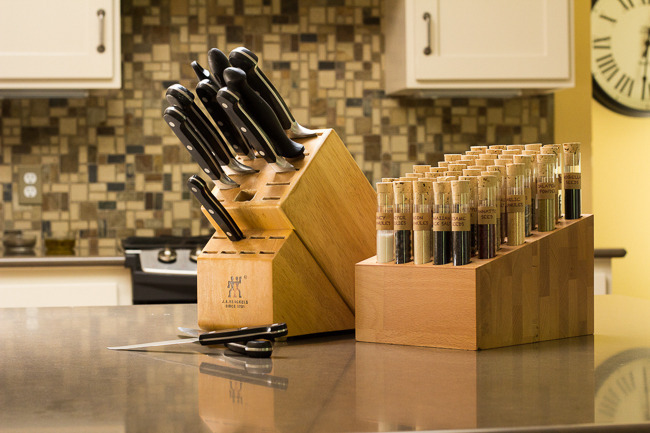 But the Spiceologist block would be awesome for the spices that I use every darned day. And it looks cool. All retro-sciencey. I think it would be just plain FUN to pour my spices out of test tubes. 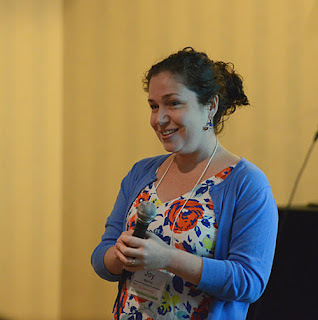 I mean, really, I sort of cook like a mad scientist, so why not look like one, too? Or wouldn't this be absolutely adorable for cake decorating supplies? Colored sugars, sprinkles, those little colored dots, edible glitter - can't you imagine that? Or maybe for an array of salts and sugars for your bar. Or all of your favorite spices for popcorn. Or an array of chile powders, ranging from sweet paprika to ghost peppers. Or ... or ... whatever you can think of. 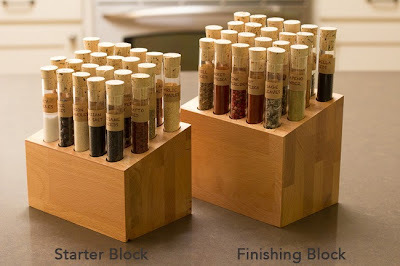 There's a starter block with 22 spices (or 22 empty holes or 22 empty tubes) and then you can add on with a second block that holds an additional 22 spices. I tell ya what. I've got NO space on my counter, but I want this thing just because it looks so awesome. And fun. And quirky. But it's not for sale yet. First, it has to be funded. Then, it has to be manufactured. The estimated date you'd get your Spiceologist Block (if you fund the Kickstarter at that level) is November, 2013. Just in time for Christmas for you, or for a gift. And if my friend Heather says that the spices from Savorx are good, then I believe her. I've already browsed the shop and there are some really interesting items I haven't seen elsewhere. And heavens knows I've got a ridiculous number of spices already. So if you can't fund at a level to get a Spiceologist Block, then maybe you need some spices. Go, take a look. See what you think. See if it's worth funding. See if you've got $5 in your pocket to get an eBook, or a little more for some spices, or a little more to get a Spiceologist Block for yourself for Christmas. Won't it be a great conversation piece? But don't do it for me. Do it for yourself. Because you want one of these, don't you? And do it for Heather. She's a great gal, and I'd love to see her vision become a reality. Check it out! Last Monday, I posted some recipes from Crown Royal for #MapleMonday. One was a lemonade, and the other was an iced tea. This week, I'm using those recipes as a starting place to create some new cocktails. 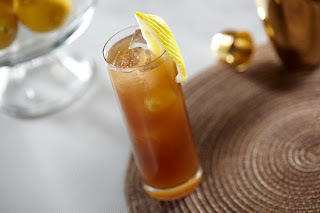 First, I revised the iced tea. I thought about using herbal tea or one of the many flavored teas I have - Maple Vanilla or Ginger Peach would have been good. But I kept thinking about iced coffee. I mean, really, doesn't that sound good? Iced coffee with maple ... mmmm. and a touch of cinnamon. After all, I was supposed to twist their recipe, and changing the tea to coffee seemed like a logical twist, right? Well, I thought it was. So I proceeded. I didn't think the orange garnish they used in the tea would work in the coffee, but I wanted to add just one more flavor to the party, so I added some almond extract to the whipped cream. It was perfect. Fill a glass with ice. Add the Crown Royal Maple Finished Whisky, then add the coffee. Stir to combine. Add a dollop of whipped cream on top, then sprinkle the whipped cream with the cinnamon sugar. Garnish with a cinnamon stick and/or a sugar cane swizzle stick. *I used decaf, but regular coffee is fine, as well. **There are flavored whipped creams available in cans, but I whipped my own cream with a little bit of powered sugar and just a touch of almond extract. As much as I like lemonade or plain old orange juice, lately I've become quite fond of orange/pineapple/banana juice - it doesn't seem as acidic as plain orange juice, and the flavor is a little more complex. The first time I bought it, it was in a bottle in the refrigerated juice section, but lately I've been buying the frozen concentrated juice. If you can't find orange/pineapple/banana, a mix of orange and pineapple juice would make a good substitute. So, when I got the lemonade recipe from Crown Royal for last week's post, I thought an interesting twist would be to use the orange/pineapple/banana juice instead. To be brutally honest, at first I wasn't quite sure if I'd like the combination of maple and orange, but then I realized that the two play together really well at the breakfast table, if you drink orange juice with your maple-syrup-covered pancakes. This would be a great drink for a Sunday brunch - something different than the usual Mimosas or Bloody Marys. In a tall glass with a lot of ice, it would be great as a refreshing summer cocktail, too. Adjust the amount of liquor to taste, and the size of the glass. Fill a glass with ice. Add the Crown Royal Maple Finished Whisky. Top with the juice to fill the glass. Stir, then garnish with the lemon slice. I received products from Crown Royal for making cocktails. Jicama is a strange vegetable, isn't it? It's a little starchy and a tiny bit sweet. it doesn't have a strong flavor, but the crunch of it is very refreshing. It's perfect in a salad or a slaw. A mandolin with fine julienne blades is the prefect thing for cutting the jicama and the radishes - it makes perfectly even matchstick cuts, You can use the mandolin with a regular blade for the celery, or just slide it with a knife - whichever works best for you. I used a champagne vinegar with is a mild-flavored vinegar. Rice wine vinegar would also work well. If you're using a stronger flavored vinegar, you might want to use less. Also, to keep this salad looking bright, I suggest using a light-colored vinegar. As mus as I like balsamic, the color wouldn't work well here. Peel the jicama, julienne it, and rinse it in cold water to remove the starch. Put it in a medium bowl. Remove the root and from the radish and julienne - if you're using a mandoline, that stem will help keep your fingers further from the blades. Add the radishes to the bowl. Slice the celery thinly and add it to the bowl. Sprinkle with the salt and pepper, then drizzle with the vinegar and oil. Toss to combine. Taste for seasoning and add sugar, if desired, or add more vinegar or oil, if you like. So instead I chose similar flavors that I knew would enhance the peach. First, I added a bit of pineapple extract. Then I added just a touch of fiore di sicilia which has a citrus-vanilla-floral flavor. And then a little bit of rum. Since it wasn't peach season when I made this, I used canned peaches. When fresh peaches are in season, I'm sure I'll come up with another recipe. They're just starting to look good at the grocery store, but I'm really looking forward to the local ones. This recipe started out as a way to use up ingredients that were left from other recipes. The five egg yolks were left from making a cake. The almond milk was purchased for a dairy-free "ice cream" and the heavy cream was for yet another ice cream. The eggs motivated me the most, though. I hadn't made an egg-based ice cream lately, and it was just about time. I wasn't going to post about this recipe. I mean, is was just something I threw together rather than something I thought about, planned, developed, and tested. But I liked the way it turned out, so I figured it was worth writing. Heat the cream, sugar, and salt in a heavy bottomed pot over medium heat until the cream comes to a simmer. Meanwhile, whisk the eggs to break 'em up. When the cream is hot, begin drizzling the cream into the eggs, whisking the eggs as you go, until you've got about 3/4 of the hot cream incorporated into the eggs. Next, slowly pour the egg mixture back into the pan with the milk, stirring as you go. Continue cooking, stirring continuously, until the mixture thickens. You'll see and feel the change. Don't overcook though - we're looking for a thick custard, not scrambled eggs. Turn the heat off and whisk in the almond milk and vanilla. Strain the mixture through a fine strainer into a storage container, and refrigerate until thoroughly chilled. Churn in your ice cream maker according to manufacturer's directions, then transfer to a storage container and freeze until firm. *I'm not entirely sure the brand matters here, but this is what I used. I've tried other almond milks that are thinner or thicker, so that would affect the consistency of the final product. But I don't think it would be a deal-breaker. I've been lusting after finger limes ever since I saw them online, so I was really excited when Frieda's Specialty Produce sent me some this month. I had one cut open before I put anything else away. Since I'd only seen photos of them, I didn't realize how small they were. Not the size of a standard lime. Or a finger. The ones I got were about 1 to 1 1/2 inches long. The really cool thing, besides the fact that there are teeny balls of limey goodness inside the fruit, is that the insides were different colors. The first one I cut open was a pale peachy color, another was a pretty pink, and a third was a darker pink, and some are a pale green - almost like a common lime. The little balls are fairly sturdy, so they have a bit of snap to the them. The flavor is definitely lime, but maybe not as tart, and there's a whiffy of an herby-piney scent on the skin. I could snack on these like candy. I decided to toss some into guacamole and then I used another lime's worth for a garnish. Combine the avocado flesh, salt, lime juice, onion, and two of the finger lime flesh in a small bowl. Stir well, mashing the avocado to your desired texture. Put the guacamole in a serving bowl and garnish with the flesh from the third finger lime. I received the organic finger limes (and other items) From Frieda's Specialty Produce. I was not required to write a post. You might have noticed a few recipes lately using Crown Royal's new Maple Finished Whisky, including an ice cream and a barbecue sauce. Well, the folks at Crown Royal noticed as well, and they asked me if I wanted to participate in #MapleMonday. They deal is simple. They sent me cocktail recipes they created. And then I'll be creating my own twist on the recipes that I'll be posting next Monday. Which gives me all week to work on some tasty cocktails. Tough job, right? So, to get us started, here are the two recipes they sent. I already have some ideas, but I'd love to hear what you'd do to twist and tweak these recipes into something different. Go! Garnish with a half orange wheel and cinnamon stick. Fill glass with ice and top with lemonade. For my participation in #MapleMonday, I will be receiving a Maple Monday kit from Crown Royal to help me create my cocktails. 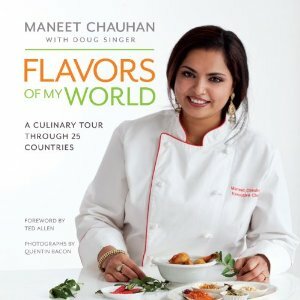 When I got Flavors of My World by Maneet Chauhan, I thought it was interesting that her book was "A culinary journey through 25 countries." I figured, hey, she travels a lot, so this must be her favorite recipes from places she has visited. Nuh uh. These are fusion recipes, taking traditional fare from other countries and then adding an Indian twist to them. Some are much more twisted than others. To be perfectly honest, I found this book a little hard to cook from. I suppose if I was well-versed in Indian cooking, it would have been easier. But there's no glossary or explanation of what the ingredients are, so I needed to look things up online. That said, the recipes and photos all looked good, and someone who regularly cooks Indian food would probably have a better idea what gur is or where to buy a sheet of vark or what a ginger-garlic paste is supposed to be. I just found it puzzling that this book didn't explain these things to make the recipes easier for folks who are new to cooking Indian cuisine. If you're willing to take this book as a sometimes-loose guide to this fusion cuisine, I'm sure you'll breeze through the inconsistencies and do what you want. But if you need a step-by-step guide with specific and detailed instructions, you'll get a little frustrated. Fortunately, you can look up herbs, spices, vegetables, and substitutions online. I finally decided to make tandoori chicken since I had almost everything I needed. I didn't have tandoori masala, but I did have Penzey's tandoori seasoning. I figured it was close enough. And while the recipe called for 4 chicken breasts, I used half of a large chicken, instead. I cut it into pieces before cooking. Heat the oil on medium heat in a small pan. This is just for toasting the spices, so you don't need anything too big. Add the coriander, cumin, turmeric, cayenne pepper, and tandoori seasoning. Cook, stirring almost continuously for 2-3 minutes, until the spices are fragrant. Watch it carefully - burned spices are not a good thing. Don't ask my how I know that. Transfer the spice mixture to a medium bowl (something that will hold all the chicken) and set aside until the spices have cooled to room temperature. Add the yogurt and whisk to combine, then add the lemon juice, garlic, ginger and salt and give it another stir to combine everything. Let the chicken marinate for at least an hour, and up to 6 hours, if you prefer. When you reach the 8-hour mark, you're risking that the chicken will develop an odd texture, so you don't want to do this the day before. Preheat your grill (I did this outdoors, but a grill pan should also be okay.) Cook the chicken on indirect heat until cooked through (use a thermometer). How long this will take depends on how hot your grill is, and also how bit the piece of chicken are. The great thing about cooking on a grill is that for something like a cut-up chicken you can move the smaller pieces to a cooler part of the grill while you keep the larger pieces closer to the fire. The chicken I bought was pretty big -- even though I cut the breast into three pieces, those pieces were pretty big. When you take the chicken off the grill, let it rest for at least 5 minutes before you cut into it. In the book, this chicken was used in bahn mi sandwiches, but we ate it as is on the first night, and made tacos with the leftovers. How's that for fusion cuisine? *A similar recipe that I used to make years ago required boneless, skinless breasts, and was cooked in the oven. The coating formed a crust of sorts. For this recipe, the chicken I used had both skin and bones. Use what you like. I'm guessing this recipe would also work well in the oven. I recently received some samples from a company called Tasty Bites and figured this would be the perfect chance to try a few of them. I thought the channa masala and ginger lentil rice would pair well with the chicken. These products are shelf-stable and can be cooked in the microwave or in the pouch in boiling water. They're fully cooked, so you just need to heat them up. It's nice that there's not a lot of extra packaging - I've seen similar foods that put the cooking pouch into a box. The channa masala was a spicy chickpea dish in a tomato-based sauce. Definitely spicy. This was a great side dish, but it would also be wonderful as a vegetarian meal on top of some rice (which would also temper the spice level). The ginger lentil rice had a good punch of ginger flavor - there was no way you could miss that. The lentils added texture and contrasting color to the dish. It was a nice spicy side, but I think next time I'd pair with with a less-spicy main dish. Three different spicy items was just a little too much. But this would have been great with some broiled shrimp or a simple pork roast. So farm those are the only products I've tried, but I imagine the others are similar. I don't normally buy pre-made products like these, but I can see how they'd be handy to have on hand. Disclosure: I received the cookbook from the publisher and the side dishes from the food company. I was not required to write a post about them.